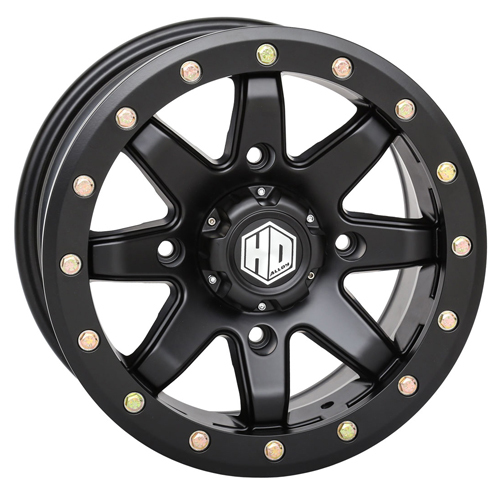 STI's newest beadlock wheel - the HD9 Comp Lock - delivers Baja-proven performance in a classic 8 spoke design. The 10 mm thick beadlock ring is secured by 5/16-inch grade-8 hardware for strength.The STI HD9 Beadlock is built for competition whether you are racing Baja or just beating your buddy up a rocky climb. * The 6+1 backspacing is recommended for RZR & Can-Am Machines 72" wide machines to keep the original factory stance width. **Wide offset wheels will push outward from most factory OE wheels. 14x10 wheels are recommended for sand use (paddle tires). 14" wheels bead hardware should be torqued to 15 ft*lbs. Wheels are sold individually. Center cap and valve stem included. Color rings sold separately. 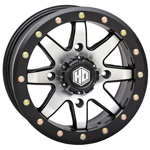 Fits�STI 14" HD9 Beadlock wheels only.